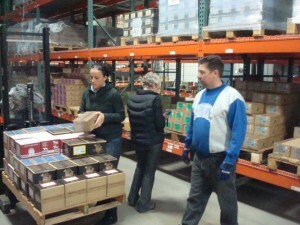 Cynthia Roy and Louise Mongeau from Marechalerie Bromont, working with Shane Trapp on order processing in FPD warehouse. Farrier Product Distribution had visits from 2 key stores this past week. Louise Mongeau and Cynthia Roy from Marechalerie Bromont in Quebec spent two days with FPD staff to gain a better understanding of the FPD operation and to discuss various business planning ideas including marketing and operational efficiencies. We were also fortunate to have Shelly Brenner stop by for her first visit to our facility. Shelly was enroute to the WCB Competition being held at the Kentucky Horseshoeing School in Richmond, KY. Shelly is one of the key employees for Anvil Brand Shoe Company in Lexington, KY. She and Allen Horton represented Anvil Brand at the WCB Event. Other FPD customers participating in the WCB event were Breeders Supply, Stockhoff’s, and Nature Farms Farrier Supply. The WCB event was in full swing the past couple days and wraps up today. Thirteen 4-man teams have been going at it, with teams from the US, Canada, and Wales in heated competition. Going into the final day the WCB team was in the lead, with the Draft competition today the final stage of another successful event. This entry was posted in Events, People, Stores and tagged clinic, Farrier, warehouse. Bookmark the permalink.